We repair and service a large variety of sewing machines. HOST is Safe for People and Pets. HOST is all natural and environmentally friendly. Rent a Carpet Cleaner Today! Is your Vacuum ready to retire? We carry a large selection of Riccar, Evolution. Panasonic and Sanitaire Vacuums and accessories. 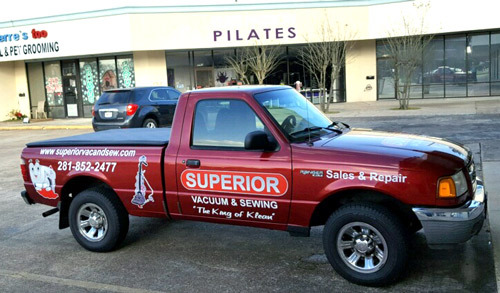 Owned by John and Adrienne Godre, Superior Vac & Sew is a full service vacuum and sewing machine sales and repair shop. We also dry clean carpets, sanitize your mattresses, rent carpet cleaning machines, and sell the best stain removers and allergy relief supplies. We’re your best source for parts, belts, and bags. 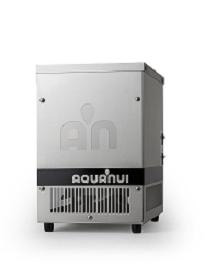 We sell commercial back pack vacuums, central vacuum systems, air purifiers, air freshener systems, AC filters, carpet shampooers, mattress covers… in short, just about any kind of product you need to keep your home clean and allergen free. As allergy sufferers ourselves, we know what it’s like to live in the Houston metropolitan area – the allergy capital of the U.S. We’ve tried many products and services and that’s why we sell only the ones that really work. Check out our new Allergies page for some of the best allergy fighting products and tips you can find anywhere. If you know of any products you'd like us to carry that we don't, please let us know and we'll do our best to help meet your needs. Superior Vac & Sew aims to be your allergy headquarters. When you walk up to one of our stores, you will see right on the door that Jesus Christ is the Chief Executive Officer of our business. When you walk in, you’ll be warmly greeted by an employee or owner. You can expect to be treated with courtesy and respect and to get a fair price on all our products and services. Consider us first for your cleaning and allergy needs, and we know you’ll return again and again as a satisfied customer. Call or drop by today! 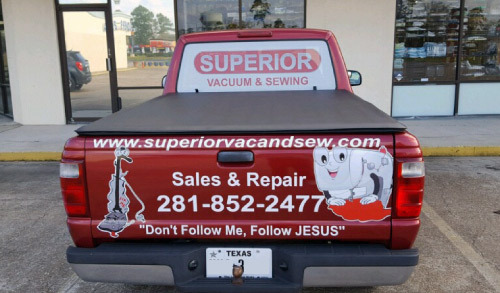 Then come in for your free vacuum belt! ACROSS FROM "MISTER CAR WASH"
WE ARE NOW OPEN SATURDAY!